Dylan Larkin has secured his future with the Detroit Red Wings while leaving open a potential opportunity to cash in again. The 22-year-old center re-signed with a $30.5 million, five-year contract. He was a restricted free agent and will be unrestricted when the deal is done. “This money is life-changing, but it’s a chance to have a contract when you’re in your prime,” he said. General manager Ken Holland said if every player on the roster reports to training camp healthy next month, the team will be about $1 million over the salary cap. 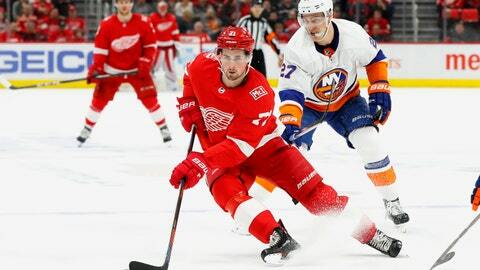 Holland isn’t sure if captain Henrik Zetterberg, who has three years left on his deal, will be able to practice or play once the season begins because of a lingering back ailment. Larkin acknowledged his deal adds to expectations. “I want to earn this and make the team proud,” he said. “I want this to be something that they look back and they say that they made the right move to sign me to five years. There’s a bit of pressure there. But it’s still the game that I love and I can’t wait to start up. Larkin led the team with a career-high 63 points and was third with 16 goals last season. The Red Wings, though, failed to make the playoffs for the second straight year after earning a spot in 25 straight postseasons. Larkin has 56 goals and 140 points over three seasons, playing in at least 80 games each year. Detroit drafted the Waterford, Michigan, native and former Wolverine with the No. 15 pick overall in 2014. He scored a career-high 23 goals and was an All-Star as a rookie. Larkin played for Team North America during the 2016 World Cup and has played for the U.S. in four world championships. “It’s a huge honor to be playing in my hometown, to have this commitment of five years,” Larkin said.